The cap on the edge of a swimming pool or spa which is mounted on the bond beam, generally covers the top of the structure is called coping. This part of the deck is normally 12″ wide and is called the bond beam. The pool coping is used to separate the pool structure from the pool decking. Coral stone copings can be used in any pool regardless the type of building decking material used. It can be combined with any type of pool pavers, stone tiles, natural stone, flag stone, brick or concrete deck. 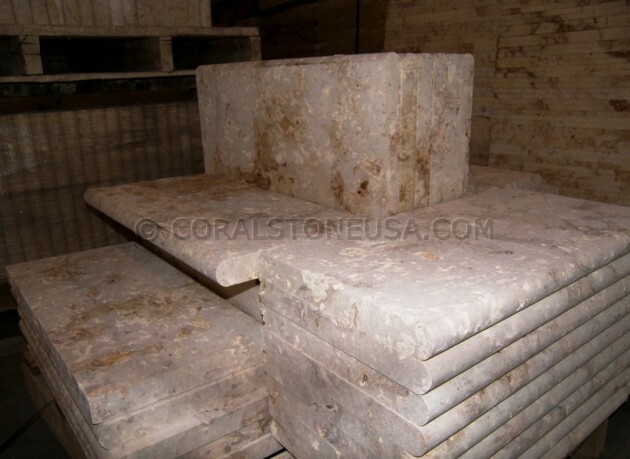 Coral Stone offers copings Bull-nose or square edge and provides a permeable, porous, non-slip surface. We also cut to size any design coping for your swimming pool.